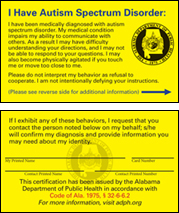 Alabamians who have a diagnosis that falls within the autism disorder spectrum may apply for an identification card that can assist in their interactions with first responders and law enforcement officers during potentially stressful situations. Wording on the card explains that the individual falls within the autism spectrum and may have difficulty communicating or understanding directions. The card further states that the person may become agitated if touched because of his or her medical condition. Before a card is issued, a health care provider must verify that the person is on the autism spectrum. The cards also contain the contact information for someone who can confirm the cardholder’s diagnosis. The identification cards were developed as a result of Act 2014-344, passed during the 2014 session of the Alabama Legislature. Download, print and bring the Autism Spectrum Disorder Card Registration Form to any county health department along with a government-issued identification card and $10 to receive the billfold-sized card.